Thursday, March 7th is World Book Day. Register here and you will receive an email with a link to download the competition pack. Once registered you will receive further emails and instructions. This year, under GDPR regulations schools will need to upload their students; full instructions will be provided, including a walk-through video link. Students will be able to use Mathletics for the whole of March. In addition to the Competition Pack Further Resources are provided including a Mathletics welcome guide. Schools are encouraged to run their own in school competitions. The competition pack includes instructions, suggestions and certificates. World Book day always encourages me to check the free books links which includes some great resources. Note in particular Colin Foster’s KS3 Instant Maths Ideas (3 books) – a wealth of ideas you can try in the classroom and freely available online. We could bring books and Mathematics together with some Statistics. 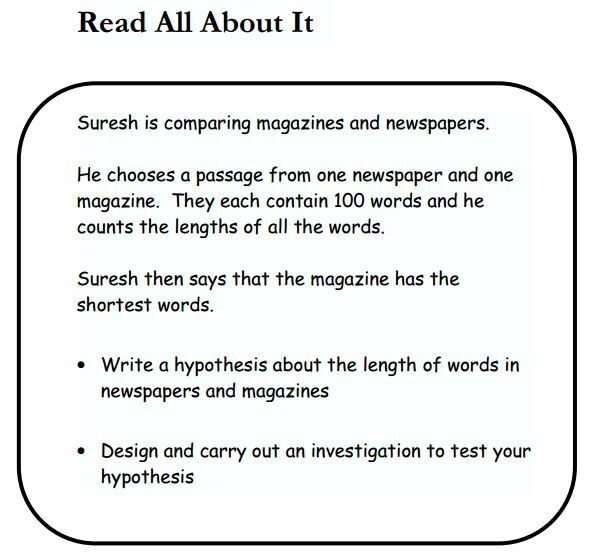 UK readers who remember Statistics coursework may remember AQA’s coursework task ‘Read All About It’ where students considered various newspapers and magazines for readability. Similarly, we have Edexcel’s Newspaper Comparisons. A search for these old coursework tasks returned this Edexel documentwhich has numerous investigations with mark schemes; Newspaper comparisons is on page 171. The document is a very useful source of problems and data handling activities.